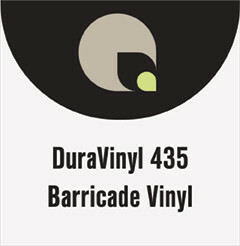 DuraVinyl 435 is a 3 mil calendared vinyl film. Always seal the top edge of the graphic with a clear silicone bead or wrap the graphic over the plywood. This will prevent water from wicking and extend the life of the graphic.